Measurement and Instrumentation introduces undergraduate engineering students to the measurement principles and the range of sensors and instruments that are used for measuring physical variables. 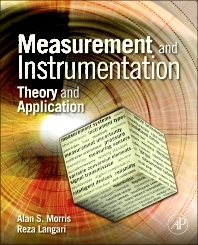 Based on Morris’s Measurement and Instrumentation Principles, this brand new text has been fully updated with coverage of the latest developments in such measurement technologies as smart sensors, intelligent instruments, microsensors, digital recorders and displays and interfaces. Clearly and comprehensively written, this textbook provides students with the knowledge and tools, including examples in LABVIEW, to design and build measurement systems for virtually any engineering application. The text features chapters on data acquisition and signal processing with LabVIEW from Dr. Reza Langari, Professor of Mechanical Engineering at Texas A&M University. Includes significant material on data acquisition, coverage of sampling theory and linkage to acquisition/processing software, providing students with a more modern approach to the subject matter, in line with actual data acquisition and instrumentation techniques now used in industry. Junior and senior undergraduate engineering students taking measurement and instrumentation courses primarily in mechanical and aerospace engineering departments. Dr. Morris Retired senior lecturer in the Department of Automatic Control & Systems Engineering at the University of Sheffield. He has taught the undergraduate course in measurement and instrumentation for nearly 30 years, as well as undergraduate courses in robot technology, engineering design and laboratory skills, and graduate level courses in robot control, modeling and measurement for quality assurance. He is the author of eight books and more than 130 research papers in the fields of measurement and instrumentation and robot control. Dr. Langari is a professor in the Department of Mechanical Engineering at Texas A&M University and head of the Department of Engineering Technology and Industrial Distribution. He earned bachelor's, master's and doctoral degrees from the University of California, Berkeley. He has held research positions at NASA Ames Research Center, Rockwell International Science Center, United Technologies Research Center, as well as the U.S. Air Force Research Laboratory. Langari's expertise is in the area of computational intelligence with application to mechatronic systems and industrial automation. He has played a significant role in the development of theoretical foundations of fuzzy logic control and its applications to problems in mechanical engineering. His work on stability of fuzzy control systems is widely recognized as pioneering the use of nonlinear systems analysis techniques to fuzzy logic.